Despite a call from Congressman Lloyd Doggett asking them not to do it, immigration officials left 50 Central American women and children stranded at the San Antonio bus station on Aug. 25, 2017 as Hurricane Harvey approached the city. Sister Sharon Alterdorf, a member of the Interfaith Welcome Coalition, said the move by Immigration and Customs Enforcement (ICE) stranded the asylum-seeking refugees inside the station because bus service was halted due to the storm. Alerted by members of the Welcome Coalition, the City of San Antonio Department of Human Services and the City Manager's office made arrangements with a local church to give the 23 families meals and a place to sleep through the weekend until bus service resumed. About two hours after arriving at the Greyhound Bus station, the women and children left for the short walk to the nearby church. 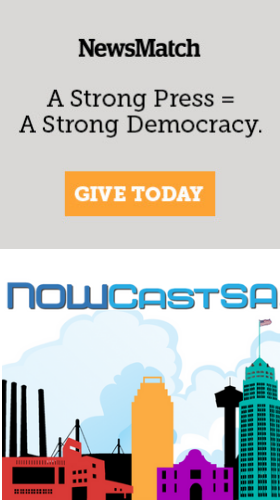 Check out the story in Buzzfeed, which credited NOWCastSA's journalism. Click here to watch a video about this event made by Human Rights Watch. Click here to watch a video about this event made by NowThisNews. The families fled deadly violence and devastation in Honduras, Guatemala and El Salvador, and are seeking asylum in the U.S. They had been detained by ICE in a private prisons in Karnes City and Dilley until they could pass a "credible fear" test showing the feared for their lives and could not return to their homeland. Having passed that test, the asylum-seekers are routinely released and dropped at the bus station or the airport to be reunited with a family member or sponsor elsewhere in the U.S.
ICE drops an average of 20 families per day at the bus station, and the Interfaith Welcome Coalition was formed in 2015 to assist the women and children along their journey. Volunteers go to the bus station daily to help the families and give them backpacks filled with food, books and toys. Doggett's office confirmed that he had called ICE and asked them not to drop families at the bus station until after the storm when bus service resumed. "It is a repeat of Christmas that we tried to avoid," said Alterdorf. "I'm very angry that despite our plea for them not to do this, despite the plea from Doggett's office, they dropped off these women and children to basically just be left on their own in a bus station in the middle of a storm against all human rights."